When I was an undergraduate, there were no options for late-night dining in Cambridge, and only a few for those willing to cross the river into Boston. Having had our fill of Buzzy’s Roast Beef, a sketchy all-night sandwich joint in the shadow of the old Charles Street Jail (now the boutique Liberty Hotel, with a restaurant called Clink), we eventually located Bo Shek, a restaurant in Chinatown that stayed open until 2 AM. The food was tasty, plentiful, and cheap, the waiters were surly, and the cook liked to scream at his staff so loudly that were were certain we were witnesses to murders. I enjoy appropriating the out-of-date and borderline-racist term Oriental whenever I get the chance. I had two fresh two-pound bags of mussels from my local fishmonger, so mussels with OS would be on that evening’s menu. 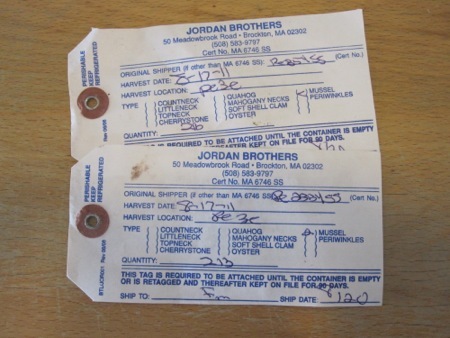 You do know to check the tags on your mussels to see when they were harvested, don’t you? In addition to the mussels, I assembled a third of a cup of denjang (Korean fermented bean paste), two tablespoons of sherry vinegar, two tablespoons of minced fresh ginger, six thinly sliced garlic cloves, two tablespoons of sliced scallions, a half cup of julienned scallions, a cup of dry sake, and a quarter cup of canola oil. I combined the denjang, vinegar, ginger, sliced scallions, and garlic in a smal bowl. I poured the oil into a large pot on high heat, then added the mussels. 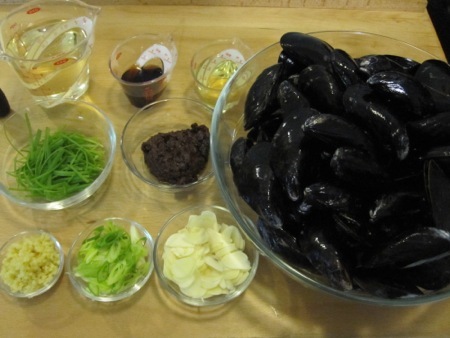 After stirring for about a minute, I added the sake, covered the pot, and let the mussels steam – about four minutes. After the mussels opened, I added the sauce mixture to the liquid at the bottom of the pot and stired to combine, than tossed the mussels to cover with sauce. 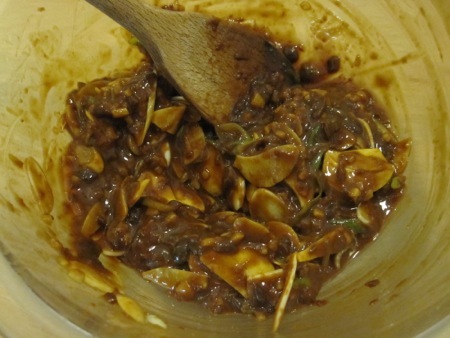 I ladled the muscles into a bowl, garnished with the julienned scallions, and poured the sauce over the top. The cooking technique is no different than the traditional moules marinière, it just substitutes sake for white wine and the ginger/bean combination for tarragon. 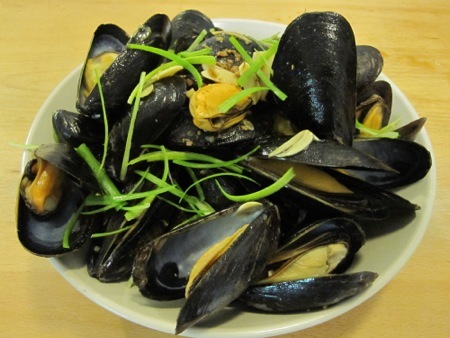 The taste, however, is completely different, a recreation of the black bean sauce I remembered, with the added flavor of the fat, juicy mussels. And It all came together in half an hour. Bo Shek is no longer a restaurant; it’s a bakery/tea house. Fortunately, I now have another way to obtain my sauce fix. I think I’ll try it again with local fresh clams to see if I can reproduce the dish from memory. Oh, and I’ve been having a craving for fresh mussels for WEEKS. 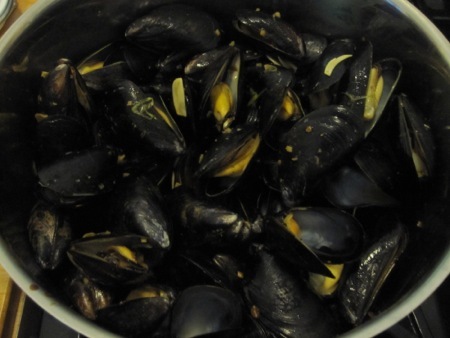 As soon as the mussels season starts here, I will certainly try this recipe! I have made moules à la marinière hundreds of times and every now and then I tell myself I should change the seasonings and try a more… oriental way 😉 Then I end up with marinière of course (although I don’t add tarragon, but parsley). Anyway, your recipe looks fantastic and is a big motivation to break the vicious circle.